Volkswagen CC Performance, Engine, Ride, Handling | What Car? It’s impossible to pick a bad engine in the CC range. The 1.4-litre petrol has ample performance and although it isn’t as economical as the diesels, it is much cheaper to buy and more refined. If you’re buying privately and don’t do many miles per year, it’s a good option. If you want a GT or R-Line CC, then you’re forced to opt for one of two diesel engines. Both are 2.0-litres in capacity and come with either 148bhp or 181bhp. We would suggest you stick with the less powerful version, as it’ll be cheaper to run yet still offers adequate performance. 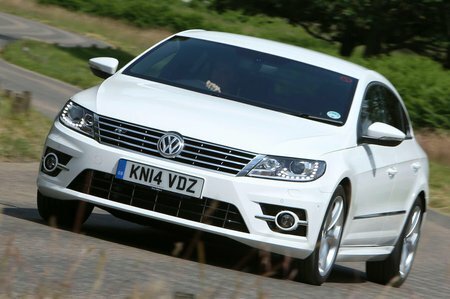 The 181bhp motor does make the CC feel quite brisk but it doesn’t transform it into something sporty. Even when pushed hard, the handling is safe, secure and uninvolving. Adaptive dampers come as standard on some models, but we’ve found that comfort mode allows too much body float and sport is too firm for the majority of UK roads. With that in mind, we wouldn’t bother opting for them on lower models. We would also avoid the 19in wheel option. They look great but mean you’ll feel rough surfaces far more than with the smaller rims. Refinement isn’t bad, either. Although the diesels make themselves known when accelerating hard, they settle into a muted hum when cruising. At speed you do notice some wind noise, while the suspension can sometimes be noisy when absorbing bumps.